The gourmet pizza, salads and sandwiches are as hot as the stylish diners. 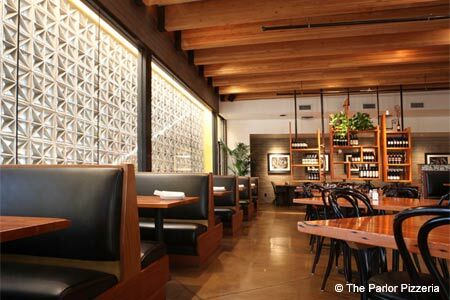 : Hip and artsy, this sleek restaurant offers pizza that’s as hot as the stylish crowds that converge. No wonder the pies are first-rate --- owners and father-son team Dan and Aric Mei hail from the same family that introduced Nello's Pizza to the Valley 25 years ago. But here, they’ve gone much more modern, featuring gourmet pizzas like grilled radicchio, sage and saba; or speck with olive tapenade, ricotta and arugula. You’ll want to start with the antipasti plated with arancini (crispy risotto balls with pomodoro and Parmigiano) and eggplant cannelloni with house-made mozzarella. For salads, there's roasted beets with walnut-crusted goat cheese and fennel, while sandwiches include a duck breast club with apple wood-smoked bacon and red wine tomato jam. Pastas, such as linguine with shellfish, are made in-house. Just be sure to save room for the banana cream pie trifle or sweet potato cheesecake. The global wine list complements the food (there's even the Arizona-produced One Night Stand rosé), though it’s easy to get distracted by clever cocktails such as the watermelon agua spiked with vodka and fresh mint.